When deploying web applications, or any other type of application, it is often needed or at least very useful to have different versions (or stages) of it deployed. Those usually are Dev, Staging, Production and so on. However, it becomes quite a pain to manage different versions of each of your Kubernetes resource files. Multiple choice of template flavors. Choose from Bash, Go or Template style. Support for loading .env files. Fail fast in case of undefined variable(s). Let's go through the initial setup and example usage below. First, you will need to download kubetpl and add it to your $PATH. To download on macOS or Linux you can use the following command, and on Windows you can get the executable here. You should now be able to use kubetpl directly from anywhere. 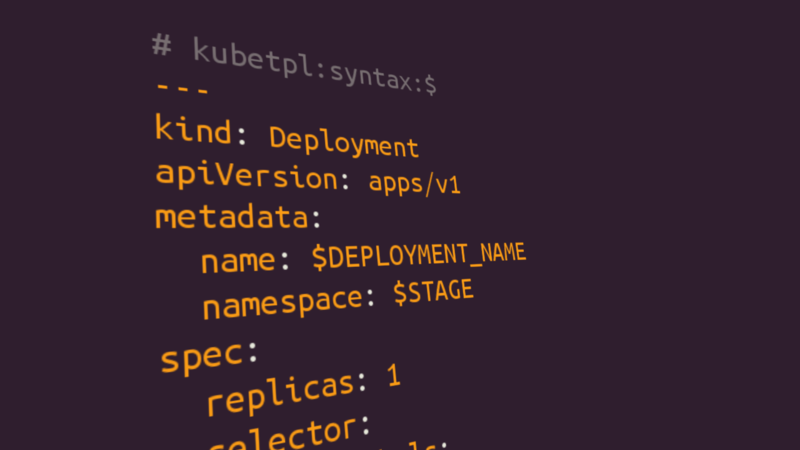 Now, let's get to the main event, writing our templates and rendering them with kubetpl. You will want to start by creating your template file(s), let's look at the example below. It defines a Deployment of one redis container, exposed to the cluster via a Service. We will be using the Bash style templating (note the # kubetpl:syntax:$ line at the beginning). This will output the rendered template to your console, you can use this to validate that your result makes sense. Now, as you can see it becomes quite tedious to enter all those values in the command line every time we have to render a template. A better option is to use the -i argument, which allows you to load a .env file containing your values. It can also be combined with -s for convenience, which allows you to set or override values. With this we can simply run the command below to achieve the same result as earlier. Or maybe we want to change the SERVICE_PORT and DOCKER_TAG. And then, once you are satisfied with your templates you can pipe the output tu kubectl to apply your changes directly on your cluster. Overriding the number of replicas for each stage. Trying different tags for your images. Setting up your container's environment variables. Configuring your domain names per stage.